CLICKER has many functions. 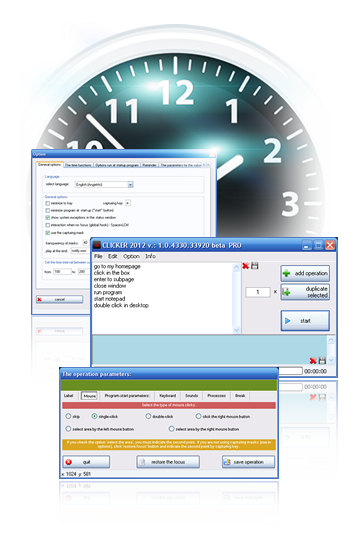 With this app You can call a different mouse click, write text, open the website (url), restart the computer at a specified time. Its fully programmable. Just create a list of commands and invoke them in multiple cycles. If you like the free version of the program, feel free to forward symbolic grants. As a reward I have for you Clicker PRO version. Link to this version can only be obtained after the grant in the amount: 4EUR or 5USD . Before you donate, make sure the free version suits your needs. After payment, please let us know via email: to send a link to the program (please be patient here, I'm not always at the computer). Do not share this program and don't publish a link to the program on other websites. • no 2 Second Delay when starting list of operations.